Today we’re going to talk about a Pay-Per-Click subject that you need to know about if you’re running your own PPC marketing campaign. Of course, if we’re running your PPC marketing campaign for you, we’ll take care of it, but if not, this is something you should know. With your Pay-Per-Click marketing campaign, you want to take a look at negative keywords. Basically, when you’re matching on keyword phrases and you’re doing a broad match on “short sale”, for example, anyone that types in these two keywords, your ad will show up. There are a lot of examples of phrases that have those two words, but they’re not looking for what you’re selling, for example JCPenneys “short for sale”. It has “short” and “sale” but those people are looking for clothes, so you’d put JCPenney as a negative keyword. Anytime your keyword shows up and JCPenneys, don’t show my ad; these are like stopping keyword phrases. If you set up your broad matches and log into your account at Google Ad Words, go to keywords and roll over where it says “keyword details” and select the option that says “all”. This will show every keyword that your ad has ever been shown for. If you go through the list for keywords that don’t match what your ad is selling, add them to your negative keywords list. This can save you lots of money because a lot of times it will be someone that was looking for shorts, as opposed to short sales, but still saw your ad and clicked on it. You want to reserve your money for people who are highly interested to what you’re doing. Find those negative keywords and add them to your campaign because it will save you money. Again, my name is Andrew Houglum with Direct Business Marketing. 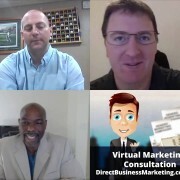 I would like to draw your attention to our Marketing Assessment at https://directbusinessmarketing.com/ma; you can download this document and it will help you with your marketing campaigns and strategies for your business. Hello, my name is Andrew Houglum with Direct Business Marketing. I want to talk about a mistake that a lot of people make when they are managing their pay-per-click account. If you have a pay-per-click account through Google Ad Words, up at the top they have a lot of suggestions to help your campaign along. Now, something to keep in mind with these suggestions is Google’s whole goal in life is to spend your money that you have allocated for your budget as quickly as humanly possible. They want the money. Your goal is not to do that. Your goal is to have higher conversions or get the right clicks to your website or people that are looking for your products and services. From time to time, Google will make suggestions for keyword phrases telling you that you can get 20 more clicks if you use their keyword phrases. Again, our goal isn’t clicks, our goal is conversions. So, analyze every one of those suggested terms. There is a button that says, accept all suggestions. Don’t ever do that, because you want to go through the suggested terms and make sure they match for you. I’ll give you one example. Let’s say you are a realtor and maybe you are looking for people to sell their house, well some suggestions might be homes for sale. Well, those are buyers, that are someone looking to buy a house, not sell a house. So you don’t want to take those keywords. You have to weed through those keywords and don’t take every suggestion because what you will end up with is you will blow through your pay-per-click budget and not have the conversions that you want. Here’s my contact information and my name again is Andrew Houglum, with Direct Business Marketing. My phone number is 602-571-5803 and my email address is [email protected] I want to draw your attention to https://directbusinessmarketing.com/ma for marketing assessment. It’s a great tool to use to assess your marketing today. Thanks and have a great day. Hello everyone Andrew Houglum with Direct Business Marketing here today to talk about some search engine improvements you can make. I am talking with business owners every day about ways to improve their Google search results and have come up with some simple guidelines to get you started. By following these guidelines you can better position your company to be exposed to the largest audience available. Nearly every day I am asked how to get to page one of Google. One of the easiest ways is to pay for it through Pay-Per-Click marketing. The first step to a successful PPC is doing keyword research. Google provides a free search called Google Keyword Tool that will show you how many people search on those words every month. This tool will also give you suggestions for other keywords to consider that pertain to your business. Once you have established your keywords make sure to group them by topic. Doing this will give you a better quality score on Google and help you find different kinds of clients. Finally, once you have loaded up your keywords make sure to use broad matches in order to give you the most bang for your buck. This will give you a better understanding of what works and what doesn’t in the beginning. Once you have that established you can focus these keywords or phrases around the results you have seen in the past. These three steps will help you better utilize the Google search engine through Pay-Per-Click advertising. For more information on improving your reach make sure to download the free marketing assessment tool on my website and contact me with any questions you have. Once again I’m Andrew with Direct Business Marketing thank you for your time and I look forward to speaking with you in the future.